Fund for Assistance to the ROCOR - Make sure your favorite monastery gets $10,000! But there’s one condition before they can claim it: donors have to match the gift dollar for dollar. The simple truth is that summers are a very difficult time for monastics. Donations always decrease after Pascha. People go on vacation, there are graduations, weddings, trips to be taken… life happens. Meanwhile, monasteries suffer financially. At the time of year when they can do most projects around the monastery, they are forced to go into survival mode. I hope that you will make sure this doesn’t happen this year. We’ve written before about the problems both monasteries have experienced in the past. Holy Trinity Monastery is in dire need of restoring its entire infrastructure, and Holy Cross Monastery is having trouble accommodating all those wishing to remain at the monastery permanently. And you were right there to help! Thanks to generous people like you, to date Holy Cross Monastery has received $255,000, while Holy Trinity Monastery received $174,000. Your generosity has perpetuated great changes at both monasteries, but the summer problem remains. Your gift today will ensure that our brethren not only survive, but thrive this summer. cover daily expenses such as food, electricity, water, etc. And remember, each dollar will be doubled if you donate by July10! 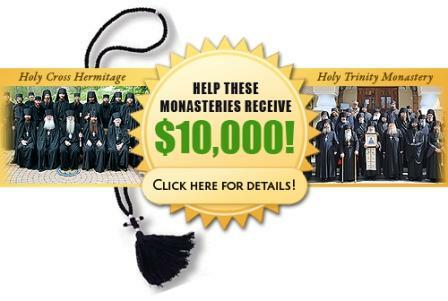 With your help Holy Trinity and Holy Cross monastery will gain $20,000 (and very likely more!) in financial support! The impact for the cash-strapped monasteries will be incredibly important! When you give this time, you’ll get twice the bang for your dollar. Your gift of $10 will expand to $20 impact. Your gift of $500 will balloon into a massive $1,000 of impact! P.S. Don’t forget to send in prayer lists! You will be commemorated forever as benefactors of both monasteries!